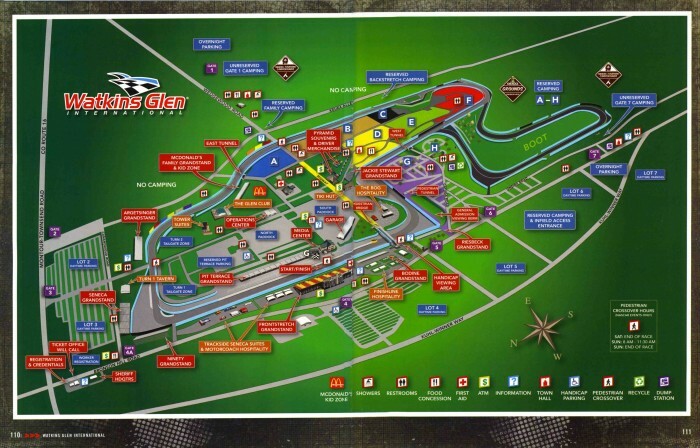 Next track on the schedule for Pirelli World Challenge is New York's classic road course Watkins Glen. These will be the final rounds of the championship and will decide the titles in GT & GTS Sprint and Overall, as well as the TC championships. The entry list features the return of the Acura NSX GT3 to PWC, with the #93 Realtime Racing/Honda of America Racing Team entry set to be piloted by Mario Farnbacher. The #2 CRP Racing should be driven again by Michael Cooper, though the entry list currently shows a TBA. On the championship points side, Toni Vilander leads the GT Overall standings with a 29 point advantage over Scott Hargrove and 32 points over Michael Christensen. In GT Sprint, Hargrove leads Vilander by just 8 points and Christensen by 14. In GTA, Martin Fuentes heads the standings, Yuki Harata sits 18 points back and Parker Chase 29 back. In GTS, the Overall standings are led by James Sofronas, with Harry Gottsacker 38 points back in second. Sofronas also leads the Sprint standings, but with Lawson Aschenbach in second, 21 points behind. In GTSA, Drew Staveley holds down the lead with 123 points, Jeff Courtney is 6 points back in P2, and Mike Hedlund and Tony Gaples are each 22 points back. Ryan Eversley leads the TCR points, but the always fast Michael Lewis is just 7 points back in second. Lewis' teammate Wilkins is in third, 25 points behind the leader. Vesko Kosarov leads TC, and Tom O'Gorman leads TCA. Looks like they'll get an addition to end the season with an HART/RealTime with an assist from MSR NSX with Mario Farnbacher at the wheel. Very cool! Hopefully HPD can get some cars on the grid full season next year. Fuentes GTA Ferrari 488 GT3 is another late withdrawal, along with the previously announced Parker Chase Audi R8 LMS and Yuki Harata's Lamborghini Huracan GT3. So that only leaves David Askew in the Mercedes AMG GT3 as the sole GTA entry!